On her regular Friday-morning shift, Katie walks into White Rock Elementary and is greeted by the excited students she has come to help read. She has two associates in tow – 200-pound, three-foot-tall Chewbacca, whose head could compete with the size of most watermelons, and nine-year-old Dougal, who has been known to sit on students when she senses they are having a rough day. Despite having a bad back and sight in just one eye – not to mention being a dog – there is no doubting Katie’s ability to engage young learners. The six-year-old miniature English bull terrier has been coming to the school the last few months to provide a non-judgemental and inviting audience for students who are working to improve their literacy skills. As a fully trained therapy dog certified in the Reading Education Assistance Dogs (READ) program, Katie – as well as Chewbacca and Dougal – can sit for extended periods of time as children read aloud to them. For youngsters like Teaghan Summerhayes, practising with dogs makes the daunting prospect of reading in front of a classroom easier to stomach. The animals are animated listeners, often perking up their ears at certain points in a story, or – as is the case with Katie – barking when a student forgets to show her a picture before turning the page. “I like the fact that when you get to read with the dogs, the dogs actually understand what you’re saying,” Summerhayes says. 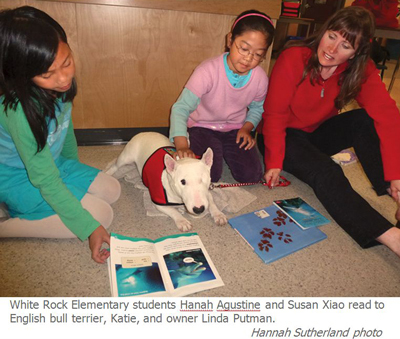 The program was brought to White Rock Elementary by school parent Linda Putman, who began volunteering to read with students last fall with the intention of eventually introducing them to her dog, Katie. Katie had nearly completed her therapy-dog training when she lost sight in one eye due to glaucoma. Two years later, after recovering and relearning the necessary skills, the terrier gained her READ certification. She now visits White Rock Elementary once a week, her resilience teaching students how capable animals and people with impairments can be, Putman says. In the program – called Hug-A-Bull Readers – Katie is joined by Dougal, who knows she is heading to the school as soon as owner Christine Bishop puts on the dog’s special red vest and leash. Katie, a standard English bull terrier, has a reputation for being sensitive to children’s moods, having eased a crying boy’s tears by simply approaching him and sitting in his lap. “I think the dogs do know they’re here for the children,” Bishop says. The pooches relax the children, she notes, distracting them from any fearful aspects of reading by being available for pats and hugs. When reciting to the dogs, students aren’t just improving their reading ability, according to Putman. They also learn comprehensive skills by explaining to the dogs what certain words mean, and work on being active listeners when reading in a group. Participants – who are selected by teachers – also gain self esteem and confidence, and practice important social skills when taking a break from reading to play soccer with Katie. They learn to work as a team and congratulate each other, all the while being mindful of Katie out on the field. Students also learn about responsibility when taking hold of Katie’s leash, bringing her water or carrying her up and down stairs due to her sore back. Chewbacca’s owner, B.J. Fleegham, says she is aware of just one other school in the Surrey district offering READ. She introduced the program to Don Christian Elementary in Cloverdale two years ago, and continues to volunteer there once a week with Chewbacca and four-foot-tall Liam, her two-year-old Irish wolfhound. It’s Fleegham’s hope that students in other schools can be given the same opportunity. But before the program can grow, more dogs need to be trained. My name is Tristan McIntosh. I am in Grade 5 and have trouble reading. I take part in the Dog Reading Program to help me read better. The dog reading program is when the dog comes into school and reads with kids. Now I will tell you about the dogs. Two dogs come to the school to read. Katie and Dougal. Katie is a great goalie. Kids love Katie and Dougal. Katie is a girl. She has one eye because of glaucoma. Doogal is a funny dog and is a girl too. She likes to role on her tummy. When I read with Katie she puts her head on the ground and her ears up to listen. Doogal puts her head on my leg to listen. As a parent I think the program is fantastic. It helped Tristan with his reading and became an activity that he looked forward to taking part in. I think that most of the credit has to go to Linda, Christine and the other’s who volunteer their time and the dogs themselves who facilitate the learning process for the kids. 1. K9care.ca Steps to be a Therapy Dog –Training starts at any age. Click on this link to start. For more information please contact Linda Putman at lin_put@telus.net.